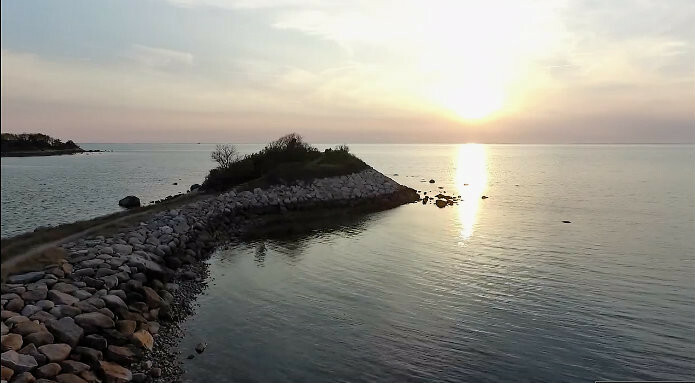 Get away to Cape Cod and have your own drone adventure on Cape Cod with Sky Flik. 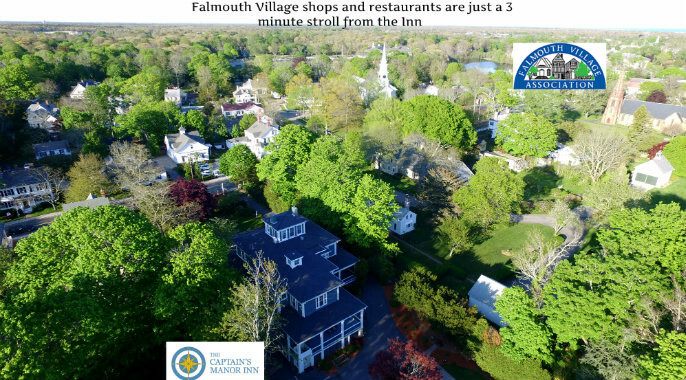 Working with Sky Flik we created a video of The Captain’s Manor Inn and favorite Falmouth Cape Cod landmarks. We thoroughly enjoyed the experience. Now we have a number of great stills photos and a video for potential guests to get a realistic view of our Inn and the Falmouth area. During your next visit to Cape Cod why not add our drone adventure package to your stay? Scroll down our blog to see still pictures from our drone adventure and read about some of Falmouth’s favorite landmarks. 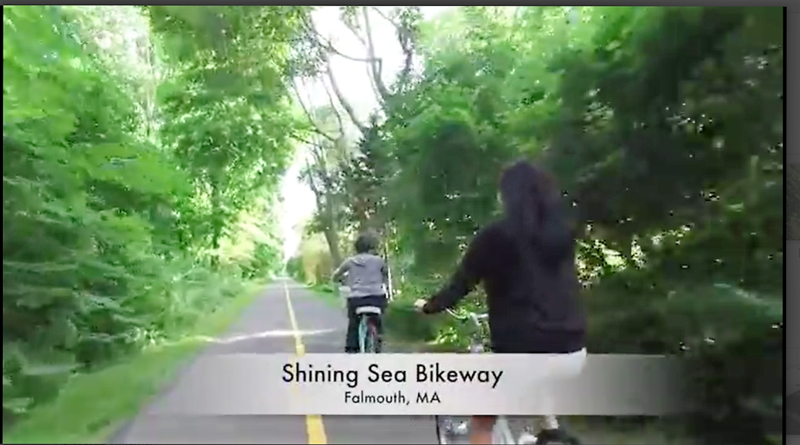 In our slightly less than 3 minute drone video you will see aerial views of our grounds, Falmouth Village, Nobska Lighthouse, the Shining Sea Bikeway and The Knob. 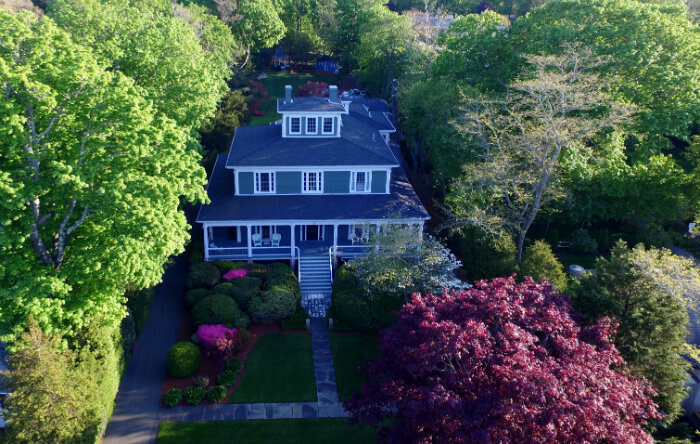 We had a gorgeous spring day for our drone adventure in Cape Cod as we took the footage for the grounds of the Inn and the surrounding area. Our desire was to show the expanse of the grounds because often guests are surprised at the depth of the gardens. Jason piloted the drone as if you were driving down the driveway to the back gardens and gazebo to provide a true feel of the space. 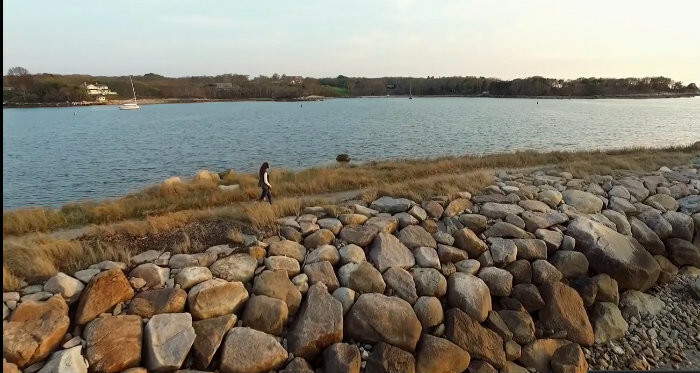 One of our favorite clips is where the drone is returning from Falmouth Village and you get a great view of Siders Pond and you can see how close we are to the ocean. For bikers, joggers, and walkers the Shining Sea Bikeway is a treasure. You just take a left out of our driveway and then a few houses down take another left to get to the bikeway. We love to walk south on the bikeway to Woods Hole. A nice stop along the way is the Salt Pond bird sanctuary just to your left on the bikeway. Stroll the winding paths around Salt Pond then then hop back on the bikeway headed to Woods Hole. This 11 mile flat bikeway is great in terms of its varied scenery. Heading south you will pass several ponds and you will hug the ocean facing Martha’s Vineyard. Your reward at the end could be a baked goodie at Pie in the Sky or a lobster taco at Quicks Hole Taqueria in Woods Hole. When you head north on the bikeway you will traverse beautiful marshes and cranberry bogs. 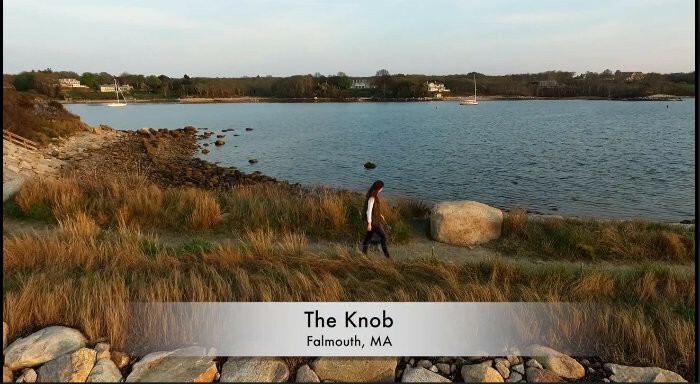 The knob is a tranquil area that has been preserved for Falmouth natives and visitors alike and where you can view incredible sunsets. It was a gift to the Salt Pond Bird Sanctuaries by Cornelia L. Carey in the early 1970s. 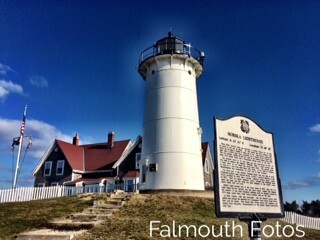 For many Falmouth natives and visitors alike The Knob remains a bit of a hidden gem. At one time The Knob was part of a 16-acre property purchased by Carey’s family in 1877. You can still see some of the former resort buildings that made up the Quissett Harbor House, was a popular resort for nearly a century which closed in 1975. From our Inn you take a right out of the driveway, then a left onto Woods Hole Road and at your first light take a right onto Quisset Harbor road. At the end of the road you are across from Quisset harbor where you will find about 20 parking spaces. Park your car and you will see the entrance path to The Knob. Walk along the harbor, next to Little Sandy, the first of the three beaches along The Knob. Your scenic walk on the trail is just under one mile from the start to The Knob overlook. At the end of your walk you will be treated to fabulous views of Buzzards Bay atop The Knob. Based on the weather and how clear the sky is you may also see the Elizabeth Islands to the south. For the nature lover and romantic we highly recommend a visit to the Knob to view the sunset. Nobska Lighthouse was established in 1828 to protect sailors in Vineyard Sound and Buzzards Bay. 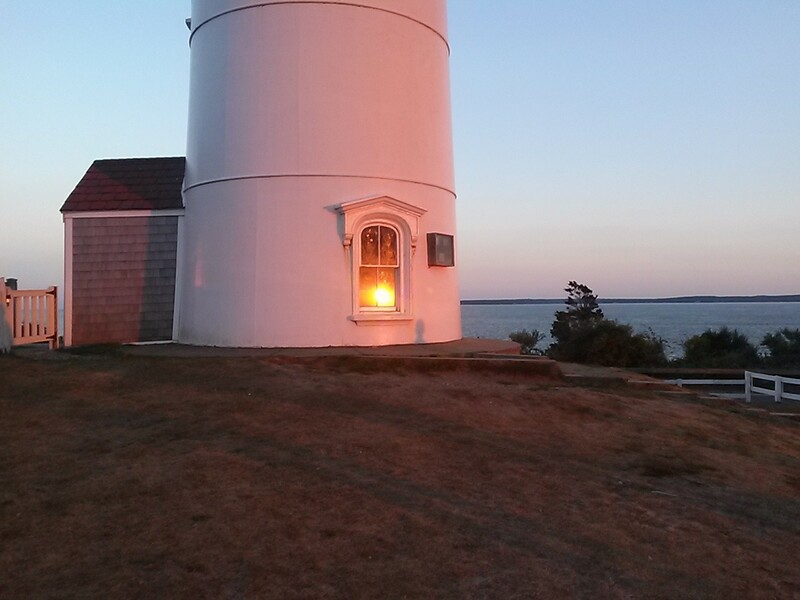 Just a few miles from our Inn, Nobska lighthouse stands on a bluff overlooking Vineyard Sound. From the bluff you can view Martha’s Vineyard, the Elizabeth Islands, and Woods Hole Passage. From 1828 until 1939 the Nobska Point Lighthouse was operated by the U.S. Lighthouse Service. In 1939 the U.S. Lighthouse service merged with the U.S. Coast Guard. 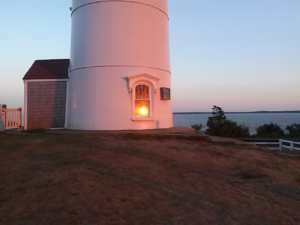 The US Coast Guard’s Commanding Officer was in residence at the lightkeepers cottage on property until 2013. In 2014, based on the need for significant repair, the Coast Guard started looking for bidders to assume responsibility for the lighthouse, tower, and land surrounding the structures. There were contingencies to include that the property would continue to belong to the federal government and therefore must be open to the public for free. Through a lot of work and cooperation the Town of Falmouth was the successful bidder. The Town gave responsibility for restoration, maintenance and operation as a museum to the Friends of Nobska Light. The Friends plan to complete restoration work and open the museum and tower not later than 2020.